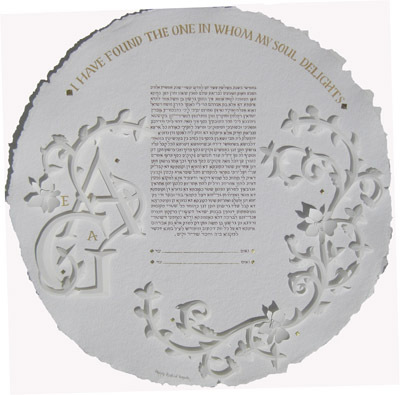 The circular Orthodox Ketubah with Hebrew text, is written in brown and surrounded with delicate 3D Paper- Sculpture Orchids and other delicate flowers. The flowers are decorated with freshwater pearls and silver studs. Some Gold Leaf "diamonds" are applied between the vines. "I found the one in whom my soul delights"
On the left are the initials of the couple, A & G, in the Paper-Sculpture technique and in between are the initials of their children's names.